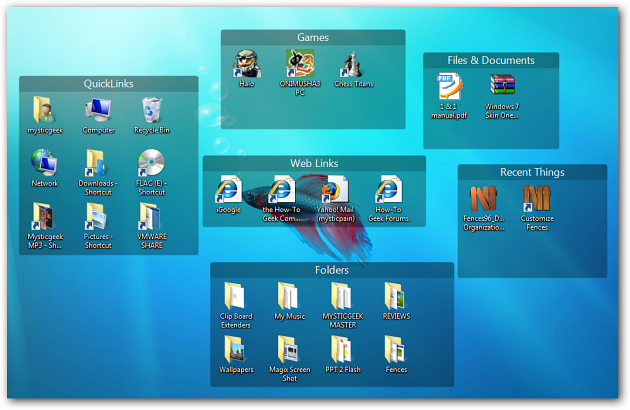 Do you have a messy desktop full of icons and shortcuts and are looking for a way to organize them? 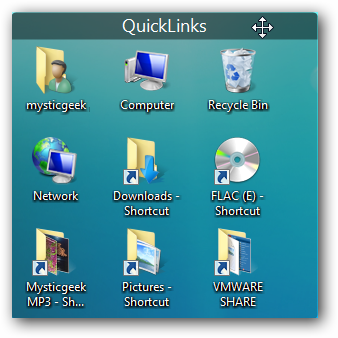 Today we will take a look at a solution from Stardock called Fences, which organizes your icons into groups for a more efficient desktop. After a quick installation you are presented with options for setting up your fences. Choose an existing layout to get started or create your own right away. If you go with a custom layout and don’t like it no worries as it is very easy to customize. If you go the layout route you are presented with a couple of layouts to choose from. If you have a messy desktop you might want to go with the sort icons layout. It will put everything into a labeled fence then you can tweak them how you want as you begin using them. After choosing your layout Fences is ready to go. 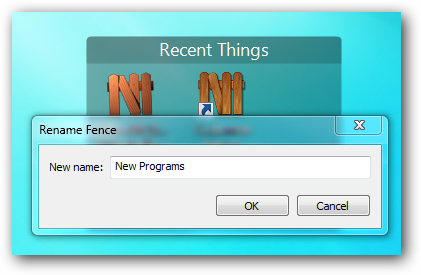 At any time you can go into Fences Settings to change different features, layout, and look of Fences. 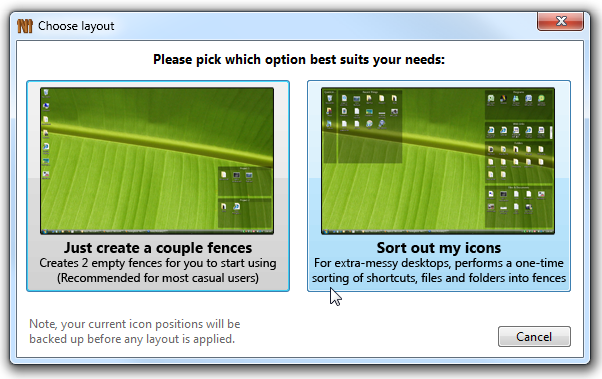 You can place as many icons into each fence by dragging the shortcut or icon into the fence. Individual fences can be easily resized by dragging the outer edges. Now the desktop icons will be arranged into different categories. You can drag the fences to different areas on the desktop that make most sense to you. 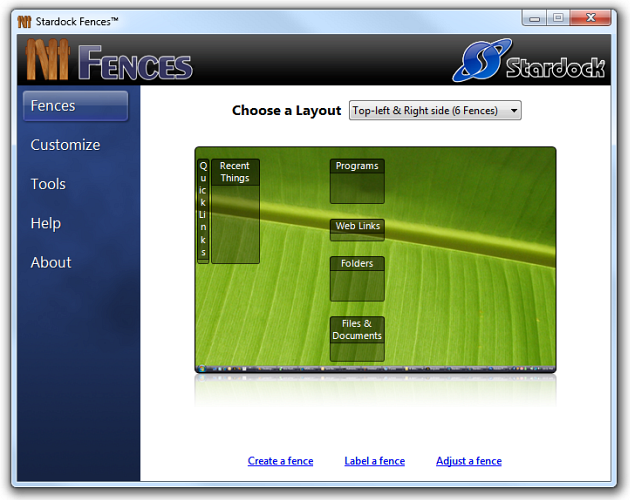 You can also rename, customize, and create new fences. You can customize the how the fences look by adjusting Transparency, color, and Brightness. To rename a fence just right click on it and select Rename then type in a new title. 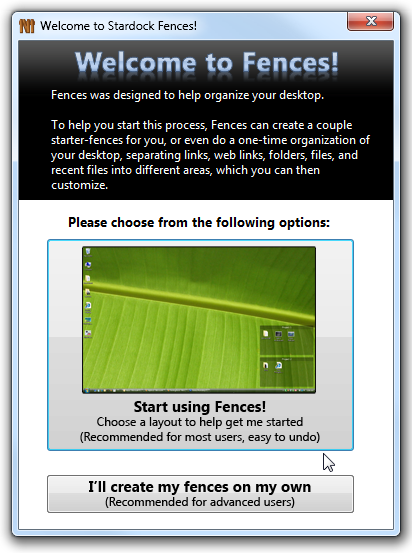 Fences is a free, customizable, and very easy to use application for organizing your desktop. It will work with XP, Vista, and Windows 7 (32 or 64 bit editions). 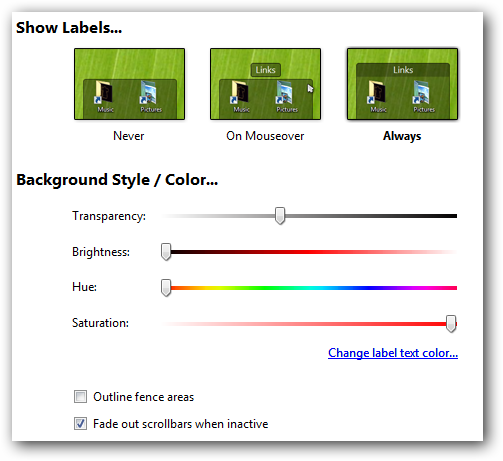 If you are looking to make that messy desktop more efficient Stardock’s Fences may be exactly what you need.